TreeSize Free 4.3 was released on January 23, 2019. We have followed development of the program since 2010 when we reviewed an initial version of it here on this site. TreeSize Free analyzes disk space usage of a structure, e.g. a drive or folder, and displays information about the number of files, total size of files on the storage device, and more, in its interface. The program serves several purposes but the main purpose is to detect large or lots of files that take up disk space to delete them to free up disk space. Our last review dates back to 2017 when TreeSize Free 4.0 was released. TreeSize Free 4.3 is available as a portable version and a version that needs to be installed before it can be run. Both versions offer the same functionality. One of the main changes in the new version is that resources with at least 15% of the location's size are displayed in bold. The screenshot above shows that USers, Windows and Program Files (x86) are highlighted in bold. You can disable the new option unider Options > Options > Show large elements in bold. Another new option integrated in the new version of TreeSize Free is the ability to export data. Select File > Export > PDF File to save the data in a PDF document on the local system. The option may be useful to create a snapshot of the status quo for documentation purposes before deleting files to free up disk space on a device. The third and final new option displays custom folder icons in the tree hierarchy. TreeSize Free 4.3 includes several bug fixes and supports for Czech and Swedish interfaces. The shortcuts Shift-Delete and Ctrl-X to delete the selection by bypassing the Recycle Bin and to cut files works as expected again in the new version. TreeSize Free is a useful program to find large files and folders on any drive or folder structure. I prefer WizTree for that which offers similar functionality but has a couple of features that TreeSize Free does not offer such as highlighting deleted files or indicators for NTFS hardlinks. 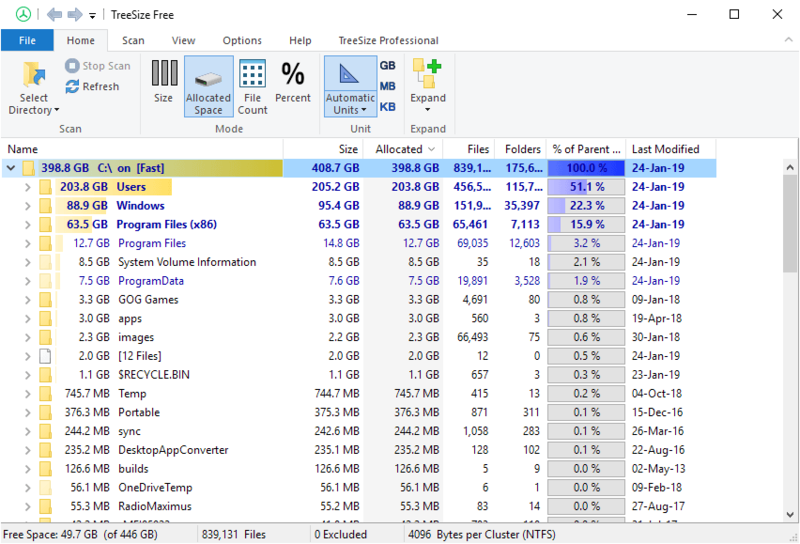 Now You: Do you use a program to find large files on your PCs? Only on Android, where space is in short supply and where DiskUsage has been very useful. I prefer WizTree because it’s very fast even on slow PCs. And, non plus ultra, WizTree is usable on network drives and remote computers! I use Disk Usage Analyzer, formerly known as Baobab, a disk usage analyzer for the Gnome and Cinnamon (and other?) Linux desktops. It shows a tree-like table and a graphical chart, either a treemap or a rings chart. It doesn’t have an export feature, something I don’t need anyway. On the rare occasions I need such a thing, I use JDiskReport. The last stable version is a bit old but there are signs of life on the site now. It’s attractive and I’m used to it but it’s probably time to try this or WizTree just to see if there are any benefits. I always have used WinDirStat which is really fast. How does this compare?